The LG G Pro 2 runs on LG's own, deeply-customized launcher dubbed Optimus UI on top of Android 4.4 KitKat. There's a rich selection of themes, icon sets and home-brewed apps on board. Here's a quick hands-on video to showcase what the G Pro 2 can do. True to its phablet nature, the LG G Pro 2 comes with multitasking-assisting features like Dual Window and Slide Aside UI. The lock key at the rear is still a novelty and one that works well on the bigger body of the G Pro 2. you can wake the screen with a double tap on it. To lock the phone you don't need to use the hardware key either. You just double tap on an empty area of your homescreen or on the status bar no matter where you are - it will lock your G Pro 2. The lockscreen can span across multiple panes, each containing one full-screen widget. The page to the right is special and fires up the camera, but you can easily disable it in the widget menu. The pages to the left contain different widgets - four different clocks, Gmail, Google Now, Calendar, Google+ posts, Quick Remote and Weather. More apps can be downloaded off the Play Store to add new widgets. With the G Pro 2 LG has implemented the Knock Code feature. It allows you to unlock the device with a predefined knock pattern, including taps in a specific part of the display. LG says there are 87,376 knock patterns (2-8 taps on the four available sections) and yours should be as impossible to break as a password. To set up the Knock Code you're guided through a screen where you enter two Knock Codes that have to match and set up a backup passcode. For many it may not be as cool or unique as a fingerprint scanner but we have to admit that it's forward-thinking and outside the box. The G Pro 2 also supports the so-called Guest Mode, activated by a specific unlock pattern. There's no app drawer in guest mode - you can access up to five apps: camera, video and music players, calculator and quick remote. You can, of course, make more apps available from the suggested list. To exit guest mode and make the full functionality available you'll need to lock the screen and unlock into standard mode using your regular password. Guest mode will come in handy if you are handing your phone to a child or you just want to keep your stuff personal from friends, who might like to use your phone for a quick call or anything. The bottom of the G Pro 2 homescreen fits up to 5 shortcuts (including the shortcut to the App Drawer). You don't have to use all available slots though - you can discard all but the App Drawer shortcut. As usual, the shortcuts are visible on any of the homescreen panes. With the exception of the app drawer shortcut, you can rearrange, delete or replace any of these with shortcuts of your choosing, even folders. In fact, most aspects of the phone's behavior can be customized, you can go to as small detail as the capacitive key layout and functionality, background, lock animation, system fonts, and even the notification light on the back. LG has its own Get to Know the G Pro 2 homescreen with information on its various and many features. You can turn it off if you like. You can also set any of the homescreen panes as default. By default you get three homescreen panes to fill up with widgets and shortcuts, but you are free to add more (up to seven) or delete unneeded ones to speed up navigation. The homescreen auto-rotates too as you flip the device landscape - a must have in phablets. Everything on the screen rotates to fit the orientation, even the capacitive keys' icons. The front touch buttons (Back, Home and Menu being the default layout) are also highly customizable. You can drag additional buttons for Quick Memo, recent apps, Q-Slide and Notification area pull down up to the original three. You can have up to five navigation buttons at a time. You can also set a black or white background for the keys and control the opacity. There is also an option to swipe the controls left or right for one-handed operations. Strangely you can't choose to hide the navigation bar in specific apps like you could on the G Flex. Perhaps that's to do with KitKat's Immersive Mode but we're just guessing here. You can resize widgets or you can even shrink a widget down to the corresponding app's icon. Also, if you move a widget over an occupied slot on the homescreen, the icons underneath immediately move out of the way, which is really neat. Adding stuff to the homescreen is done by tapping and holding on a blank area of a homescreen pane. A context menu appears, allowing you to add various customizations to your phone. The tabs along the bottom let you select the appropriate app, widget or wallpaper, which you can add to the homescreen of your choice. Gridlines will appear when you hold and drag an app or widget, allowing you to easily place it on the homescreen. There's a set of different icons to choose from and you can even make custom ones or make your own entirely. The contextual menu gives you a quick access to different settings, as well as themes. 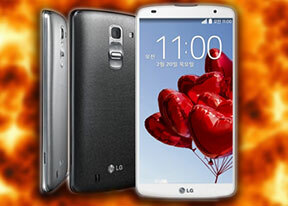 You can get more themes for free at the LG Smart World app store. The Q-Slide shortcuts in the notification area launch pop-up widget-like versions of the video player, web browser, phone, messages, calendar, email, memo, voice recorder, file manager and calculator. In case you don't need some of those shortcuts, you can remove them via the edit key at the end of the shortcut row. The Q Slide feature is very similar to Sony's small apps but supports only two windows opened simultaneously. You can resize the mini app the way you like, and there is a dedicated shortcut that'll take you to the full screen app. There is also a transparency scrubber - once you decrease the transparency even by a hair, the mini app is no longer part of the active UI (besides its transparency scrubber) and you can interact with whatever's beneath it (the mini app will continue its work of course, i.e. a video will still be playing). The notification area has also been tweaked by LG to let you rearrange the toggle buttons available. You are also free to add and remove toggles from the edit menu. You can add an insane amount of shortcuts here, and don't have to worry about whether they'll fit on the screen - the row becomes side-scrollable so you can still access them all. As usual, if you have a music track playing in the background, quick controls will show up here. You can also swipe notifications to the left or right to dismiss them. Notifications can be expanded as well. The task switcher shows you all of the currently running apps, which can be swiped left or right to terminate. There's a shortcut to the task manager too. It lists the running apps and the current use of RAM, conveniently offering a button to stop all running apps. Next up is LG's three-app multitasking feature called Slide Aside. You can use a three-finger swipe from the right side of the screen to add the app into the Slide Aside UI, while three finger swipes from the left will switch between the running apps. Slide Aside supports up to three apps which get into a sort of frozen state and you can access a preview of all the three apps either form the notification area's dedicated shortcut or via a three-finger swipe to the left on the homescreen. We had gripes with the three finger recognition on the G Flex and are happy to say that we had no issues on the G Pro 2 - the display recognizes all three-finger swipes without issues. The app drawer lists all your available apps and widgets, with a dedicated tab for user downloads. There is a button in the top right corner, which triggers edit mode and lets you to easily reshuffle or uninstall applications. You can also hide the apps you don't need but you can't install. You can opt to make the icons in the app drawer bigger, too. If you select an app whilst in edit mode, a pop up will let you see information like storage footprint. The settings menu has a tabbed interface and you swipe between tabs. There are loads of settings so you'd need a few walks before you know where you're going in this place. LG's take on the Samsung-pioneered Smart Stay is here too - Smart Screen. t uses the front cam to detect whether you're looking at the screen. This means you can browse the phone for hours on end without it auto-locking itself. We can confirm that the feature works very well. SmartVideo on the other hand will pause a currently playing video when you look away. That's another thing copied over from TouchWiz. Another LG take on a Samsung first - One-hand operations is a fotocopy of Samsung's Minuature UI. We saw this a while ago on the Huawei Ascend Mate as well. With One hand operations enabled, you can move the screen unlock, dialer, and the keyboard to the left or right of the screen, depending on which hand you are using. It's a handy feature to have on such a big device. You can also enable one-hand operations for the system-wide capacitive keys. As for Samsung's Multi Window - it's here as well but in the form of Dual Window. I t lets you run two apps side by side. You can adjust the division line giving one app more space. Only compatible apps can be used with Multi-window, for now that means mostly the ones that come preinstalled on the phone. You can't run two instances of the same app like you can do on the latest TouchWiz UI. You can still easily swap the two apps or resize the windows. LG Quiet Mode is also enabled. It works in a similar way to the Do Not Disturb feature on iOS and the Blocking Mode at Samsung's Galaxies. It gives you extra control over incoming call alerts. If turned on, Quiet mode will mute incoming calls and you can set the time of day when it gets activated every day. Just like DnD on iOS, Quet mode has an exception list where you can add some contacts that won't be affected by its restrictions. Quick Memo is integrated in the phone's OS, allowing you to capture screen shots of anything (including the lockscreen!) and scribble notes over them like you would on the G2 and G Flex, to name a few. You can save the result as an image or add it to the Notebook app. Another useful feature is the Clip Tray. Upon a tap and hold on links, images, music and video files, phone numbers or just chinks of text, you can copy them to the Clip Tray to paste later in messages, emails, the browser, etc. The Clip Tray items are displayed at the bottom of the screen (you must have at least 2 items in the tray).